While roaming the aisles of Target last week, I stumbled upon Sprinkled Donut Crunch. When it comes to cereal, I'm usually a creature of habit. The only time I don't shy away from new cereals is if I am making marshmallow treats, which was the first thought that came to mind when I noticed the box on the end cap [conveniently located right between the toy aisles - smart move, Target]. I planned on taking a few pieces out of the bag, just to test it [hi, not wasting calories on mediocre junk food]. Of course, a couple bites turned into a few handfuls. It tastes like a slightly sweetened vanilla version of the original Cap'n, but doesn't scratch the roof of your mouth. The sprinkles give it an extra bit of crunch, which I thiiiiink is what hooked me. The next day, I went back + grabbed three more boxes - in all fairness, one of those boxes is for my cousin. But these turned out so good, I'm tempted to snag another box as a backup. Hi, my name is Michele + I am addicted to Sprinkled Donut Crunch. It could be worse, right? Anyway, enough talking. Here's the recipe. Enjoy! Before you start working on the treats, prep your baking pan. Line it with wax paper + lightly coat with cooking spray. In a large pot, melt the butter on low. Once most of the butter is melted, add the salt, vanilla extract + marshmallows. Stir until melted + remove from burner [I slide to the other side of my stove to finish]. 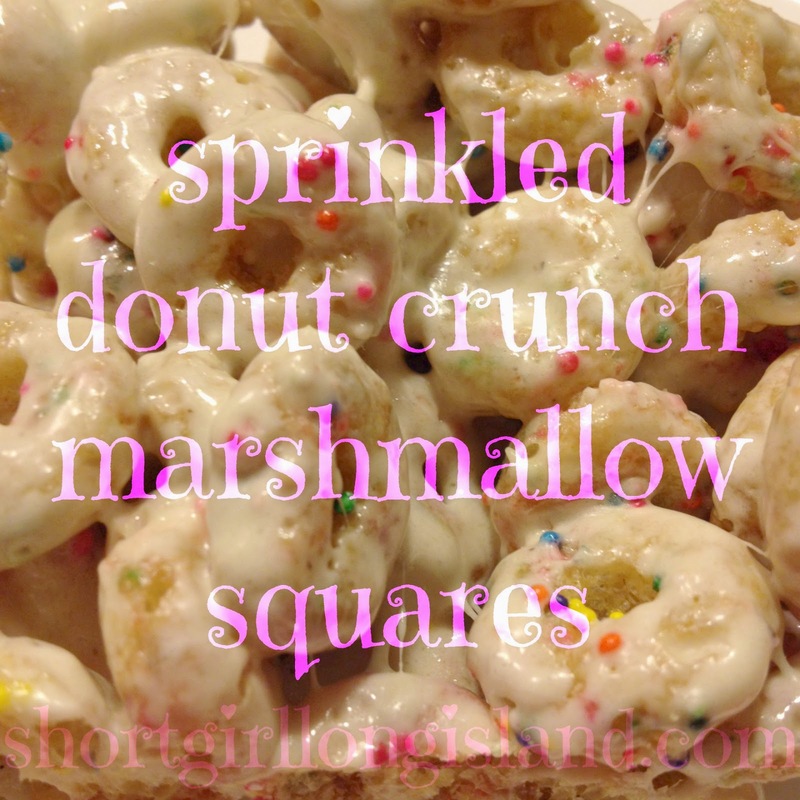 Add the Sprinkled Donut Crunch cereal into the pot + fold//stir until all bits of cereal are coated. Scoop mixture into whichever type of pan//dish you have around. The general suggestion is usually a 13 x 9 x 2 pan, but any container you line with wax paper should suffice. Make sure you gently press down on the cereal to help bind it better. To be honest, the easiest way to do this is to scoop the ingredients into the pan, spray clean hands with some nonstick cooking spray, then use your hands to press down on the cereal. I know, your hands will be a bit greasy, but one of the best tools in the kitchen are your bare hands. Let the treats cool for an hour, then slice into squares. I don't have exact nutritional information, but did some math to toss out a ballpark figure. It depends on the brand of marshmallows you choose, salted vs unsalted butter + how big you cut the squares. These numbers are an average of the ingredients I used, creating 24 servings.